Verbena bonariensis is a tall, airy plant. Clusters of small purple flowers floating on long, airy stems tempting passing butterflies to stop for a sip is just one reason to consider adding Verbena bonariensis, also called tall verbena or purpletop verbena, to your garden. 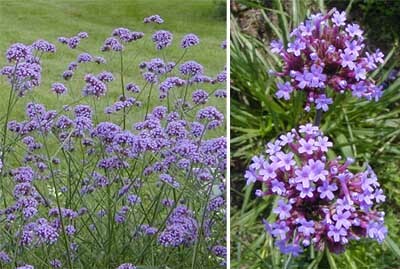 This plant is just one of about 250 species in the genus Verbena, of which only about half a dozen are in cultivation. V. bonariensis is native to Brazil and Argentina (the specific name is after Buenos Aires). They were first grown as a garden ornamental in 1726 by Englishmen James & William Sherard, who got the seeds from a dried specimen sent back to England from Buenos Aires. This plant is perennial in zones 7 to11 and is grown as an annual in cooler climates. It is considered a weed in many mild climates, such as California, Texas, Australia and southern Africa, where it has naturalized. The flowers are borne in clusters atop long stems. Purpletop verbena is an upright, clump-forming plant with wiry, widely branched stems. It reaches a height of 3 to 6 feet and spreads 1 to 3 feet. Unlike many other tall herbaceous plants it is unlikely to tip over. The stiff stems and branches are square and rough, like sand paper. The deep green, lance-shaped serrated leaves form a mounded rosette at the base of the plant, with few on the stems. The flowers are borne in rounded clusters 2 to 3 inches across. The individual flowers are little purple or rosy lavender tubes, about ¼ inch across. It blooms from mid-summer until the first frost. 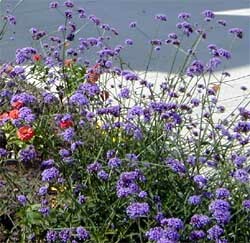 Butterflies and other insects love Verbena bonariensis flowers. V. bonariensis is very easy to grow from seed – both indoors or from volunteers in the garden. 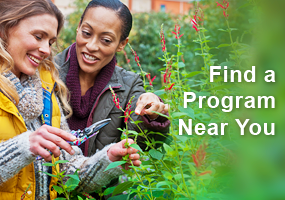 Start seeds indoors 8 to 12 weeks before the average date of last frost. Cover the seeds with a thin layer of seeding mix, as they need darkness to germinate. Germination is slow and irregular, so be patient. 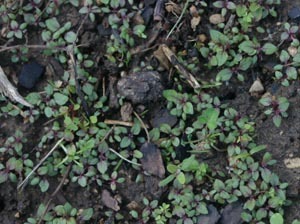 Verbena bonariensis can reseed prolifically. Outdoors, don’t disturb the soil too much in spring if you want the volunteer seedlings. Seedlings take a while to germinate, especially in our colder climate (they may not appear until as late as June). Pinching the first few shoots of the young plants will encourage branching and create a more compact, shrub-like plant. I prefer to leave them in their natural, open form. Either place transplants or thin volunteers to about 2 feet apart. If you did not deadhead flowers the previous year, you may end up with a carpet of volunteer seedlings which will require drastic thinning. If you don’t want any more verbena plants in that area, they can easily be pulled or hoed out; cultivating in early spring can also discourage germination. Volunteers can be transplanted; small plants tolerate the move better, but I have had success with plants of nearly blooming size. Try to leave as many roots intact in a soil mass when moving plants for better results. 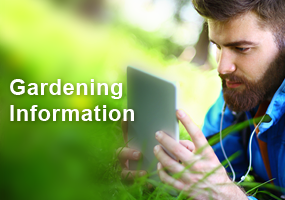 The plants will droop when their roots are disturbed, but they will recover once established. Be sure to keep transplanted volunteers well watered until they are re-established. Plant V. bonariensis in full sun and well-drained soil. 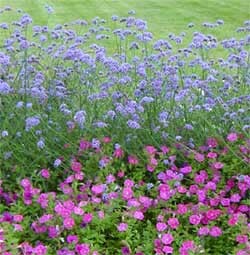 It is fairly drought tolerant so doesn’t require watering once established (unless we get no rain) and enjoys the heat. Although it will grow acceptably in poor soil, it will thrive in fertile soils with high organic matter. 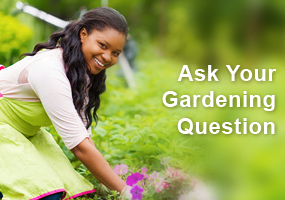 It has few insect or disease problems other than powdery mildew. The white spots on the leaves do not seem to have much impact on blooming, though.